At Greener Horizon, we provide a full suite of low-voltage landscape lighting for landscape design and build projects as well as for existing landscapes. 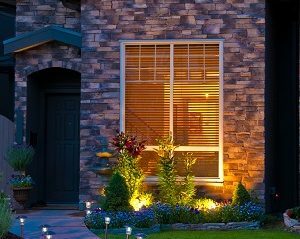 We understand that all property owners have different and overlapping needs for exterior lighting, from improving usability and curb appeal to accessibility and security of their homes and businesses. Greener Horizon offers many styles of landscape lighting to compliment your home or business while increasing the aesthetics of your property. 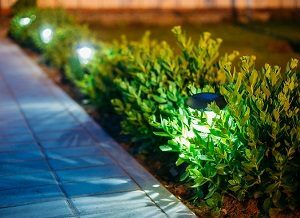 Our designers can assist you in choosing energy efficient low-voltage LED lights and lighting strips, hardwired spotlights and pathway accent lights, as well as fixtures to enhance your landscape elements. Spotlights and well lights are a great way to create shadowing and silhouetting effects within the landscape. Well lights and hardscape lights are great way accent and “wash” a vertical feature such as a stone wall with clean light, making it a focal point. From simple manual operation to timers, light sensors, motion sensor, and more, Greener Horizon can install exterior lighting to enhance the beauty and functionality of your property. We understand that landscape lighting goes beyond just enhancing your home’s curb appeal, but also acts to help protect your home. From landscape up lighting to tasteful spotlights to show off your home or business, as part of our commercial and residential landscape design, we can help increase your property’s value and image. Whatever your needs for outdoor lighting, Greener Horizon can provide it for both residential and commercial properties with our design and installation knowledge and access to multiple suppliers. If you’re interested in learning more about our Landscape Lighting services, contact us, or click the button below to request a complimentary consultation.